A recent claims analysis found that glucose test utilization varied according to patients’ type of health insurance, suggesting that differences in coverage and reimbursement affected SMBG.4 Out-of-pocket (OOP) costs for testing supplies, as an additional financial burden for patients with diabetes who may be taking multiple medications that are each subject to cost sharing, have been shown to be an important barrier to regular SMBG practices.12-15 However, a large cross-sectional study in Canada reported that implementing quantity limits for reimbursement of testing strips was not related to worsened short-term clinical outcomes.16 That study did not separately analyze the impact on insulin users. Other than this study, few studies have quantified the relationship between cost sharing for testing strips and A1C values, most likely due to a lack of available data sources that include cost sharing information and A1C levels. Published cost analyses have focused on utilization of testing supplies and associated costs.6,12,13 The few studies that have focused on A1C levels were based on small patient samples.1-3 Our study evaluated the relationship between cost sharing for diabetic testing supplies and A1C levels among patients using insulin, because patients on insulin are more likely to benefit from SMBG than patients using oral antidiabetic drugs (OADs).6,14,15 We hypothesized that patients with low cost sharing for testing strips would be more likely to attain glycemic control. Administrative medical and pharmacy claims data integrated with laboratory test results were queried from the HealthCore Integrated Research Environment, a repository of fully adjudicated claims data for approximately 25 million Blue Cross and Blue Shield health plan members across the United States. The A1C laboratory values were obtained from national reference laboratories. All study data were kept de-identified to safeguard patient confidentiality; researchers only accessed a limited dataset, devoid of individual patient identifiers, which exempted this study from investigational review board review per 45 CFR 164.514(e), Other Requirements Relating to Uses and Disclosures of Protected Health Information. Among these patients, those with at least 1 pharmacy claim with an insulin medication fill during the study period and an insulin fill within 30 days from the start date of testing strip fill (index date) were identified (n = 30,445). Patients were required to have at least 1 A1C test result within the 1-year follow-up (postindex) period as the primary measure of glycemic control. A total of 7155 (23.5% of 30,445) patients met these criteria, forming the final study sample. 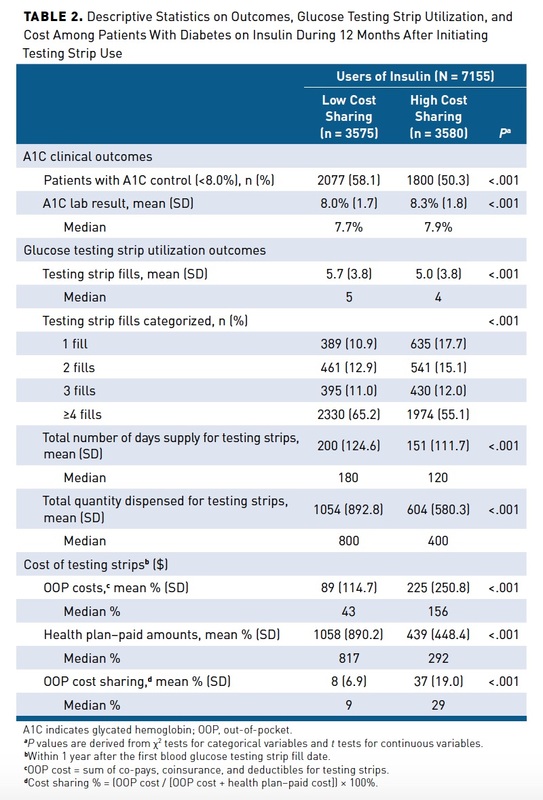 Patient cost sharing for blood glucose testing strips was calculated as the OOP cost percentage of total testing strip costs, created by dividing OOP costs by total testing strip costs and multiplying by 100%. The OOP cost was the sum of co-pays, coinsurances, and deductibles paid by the patient over the 1-year period from the first testing strip fill. The total testing strip cost was the sum of OOP and health plan–paid amounts over the same period. We chose to use cost-sharing percentages rather than dollar amounts because the latter would reflect more on adherence differences instead of benefit design differences, as patients with more testing fills (better adherence) are likely to pay more out of pocket than those with fewer fills (lower adherence). Using the median cost-sharing percentage (20%) in our final sample, we generated 2 study groups: the low cost-sharing group (OOP cost percentage below the median) and the high cost-sharing group (OOP cost percentage at or above the median). Existing comorbid conditions and resource utilization were assessed during the baseline period; A1C outcomes, utilization, and cost measures were assessed during the follow-up period. The primary clinical outcome was the most recent A1C laboratory value during the follow-up period. The number and percentage of patients achieving glycemic control per NCQA guidelines (ie, A1C <8.0%) were analyzed. For the subset of patients whose baseline lab results were available, we also reported their baseline A1C lab values. Descriptive statistics, including means (± SD) and frequencies, were reported for continuous and categorical data, respectively. Differences in descriptive characteristics between the low versus high cost-sharing groups were assessed with Pearson’s χ2 tests for categorical data and t tests or nonparametric tests for numeric data. All statistical analyses were conducted with SAS 9.4 software (SAS Institute; Cary, North Carolina). Alpha was set at 0.05. The association between cost sharing and glycemic control was first examined in the aforementioned descriptive (bivariate) analysis, followed by multivariable analysis in all patients and then a sensitivity analysis in a subset of patients. In the multivariable analysis in all patients, the likelihood of patients achieving glycemic control in the low cost-sharing group was compared with that in the high cost-sharing group through relative risk ratios, estimated from the modified Poisson model with the associated standard errors obtained from the sandwich method.18,19 Patient characteristics, such as age, gender, and area median income, were adjusted for in the multivariable model. In the sensitivity analysis, among the subset of patients with available baseline A1C values, we modeled the change in the proportion of patients achieving glycemic control before and after initiation of testing strip use with a difference-in-differences (DID) analysis through generalized estimating equations. As an exploration of the impact of testing strip use on glycemic results, we examined the proportions of patients achieving glycemic control in groups with different numbers of testing strip fills. This was conducted in the subset of patients with available baseline A1C values. A total of 7155 patients were included in the analysis: 3575 in the low cost-sharing group and 3580 in the high cost-sharing group (Table 1). The mean age of patients in the 2 groups was similar (49 years and 50 years, respectively; P <.01), although a higher proportion of those in the high cost-sharing group were aged 45 to 64 years (67.3% of high cost-sharing vs 58.7% of low cost-sharing). The low cost-sharing group resided in areas with a higher median household income (based on the zip codes for the areas in which the patients resided) compared with the high cost-sharing group (mean = $56,473 vs $53,025, respectively; P <.0001). Baseline use of medications for metabolic disorders was high in both groups (74.9% high and 72.1% low cost-sharing; P <.05). A greater proportion of patients with high cost sharing had baseline OAD use compared with those with low cost sharing (57.4% high vs 48.6% low cost sharing; P <.001) (Table 1). Testing strip utilization, as measured by the mean number of glucose testing strip fills during follow-up, was higher in the low cost-sharing group than in the high cost-sharing group (5.7 fills vs 5.0 fills, respectively; P <.001) (Table 2). More patients with low cost sharing had 4 or more testing strip fills compared with those with high cost sharing (65.2% vs 55.1%, respectively; P <.001). Not surprisingly, patients in the low cost-sharing group also had more days’ supply of testing strips (mean = 200 days in low vs 152 in high cost-sharing group; P <.001) and more testing strips dispensed (mean = 1054 in low vs 604 in high; P <.001). Although the low cost-sharing group used more testing strips than the high cost-sharing group, their mean OOP costs were significantly lower ($89 vs $225, respectively; P <.001). During follow-up, the mean number of insulin fills was similar between the groups (9.1 vs 8.9 fills, respectively; P <.07) (Table 3). 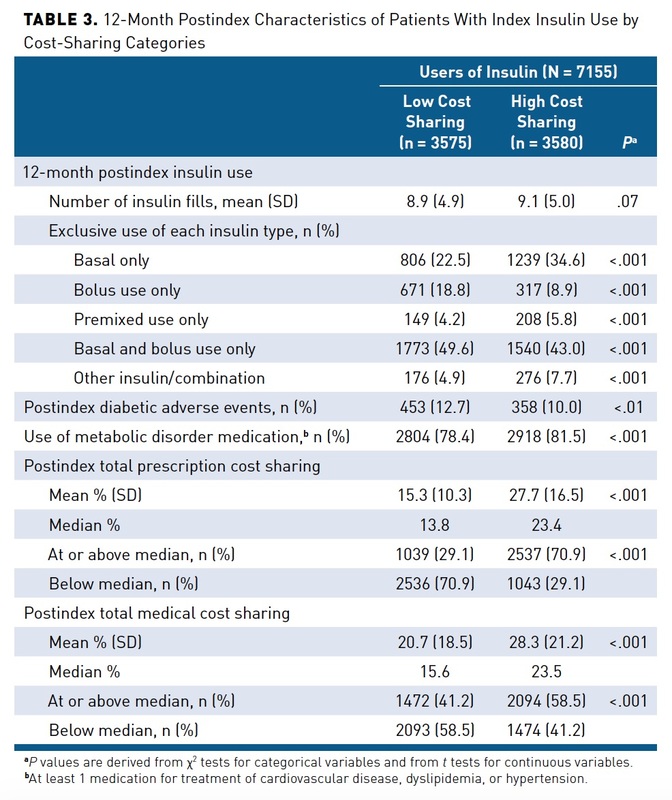 From descriptive (bivariate) analysis, in the year after initial testing strip use, patients in the low cost-sharing group achieved a higher rate of glycemic control compared with those in the high cost-sharing group (58.1% vs 50.3%, respectively; P <.001) (Table 2). 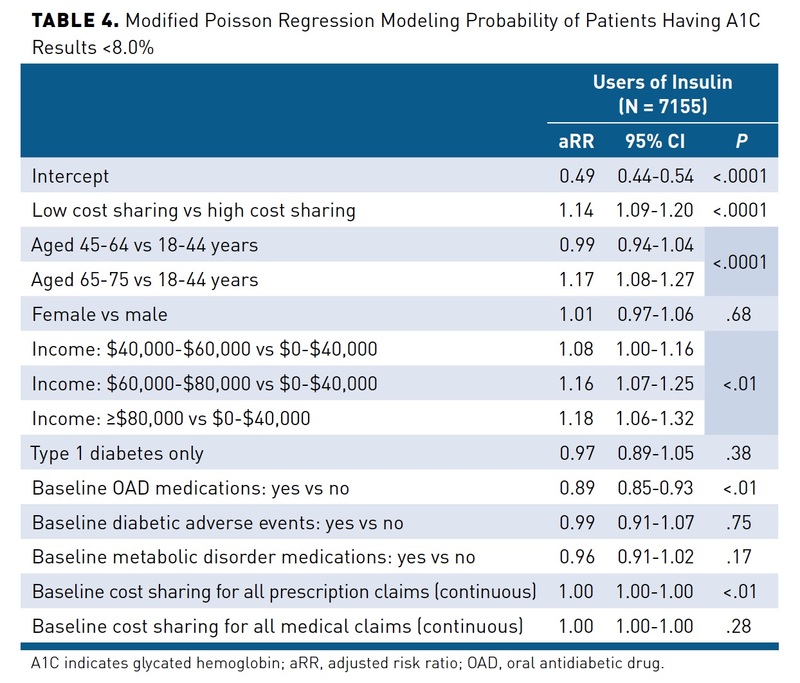 In the multivariable analysis, after adjusting for patient characteristics, such as age, comorbidities, and area median income, low cost sharing was associated with a greater probability of achieving glycemic control (adjusted risk ratio [aRR], 1.14; 95% CI, 1.09-1.20; P <.0001), as was older age (65-75 years vs 18-44 years: aRR, 1.17; 95% CI, 1.08-1.27; P <.0001) (Table 4). Additionally, glycemic control was more likely among patients residing in areas with a median household income higher than both $60,000 (aRR, 1.16; 95% CI, 1.07-1.25; P <.01) and $80,000 (aRR, 1.18; 95% CI, 1.06-1.32; P <.01) compared with those residing in areas with a median income lower than $40,000. In the sensitivity analysis among patients who had baseline A1C values, both cost-sharing groups exhibited declines in mean A1C levels from baseline to follow-up periods, although the difference was slightly greater for those with high cost sharing (19.1% vs 18.9%, respectively) (eAppendix Table 2). The multivariable DID regression model showed that cost sharing for testing strips had a statistically significant association with changes in glycemic control when comparing the baseline period to the follow-up period across low versus high cost-sharing groups (eAppendix Table 3). However, the magnitude of change as a proportion of patients attaining glycemic control was modest (DID estimate, 0.91; 95% CI, 0.85-0.98) (eAppendix Table 3). 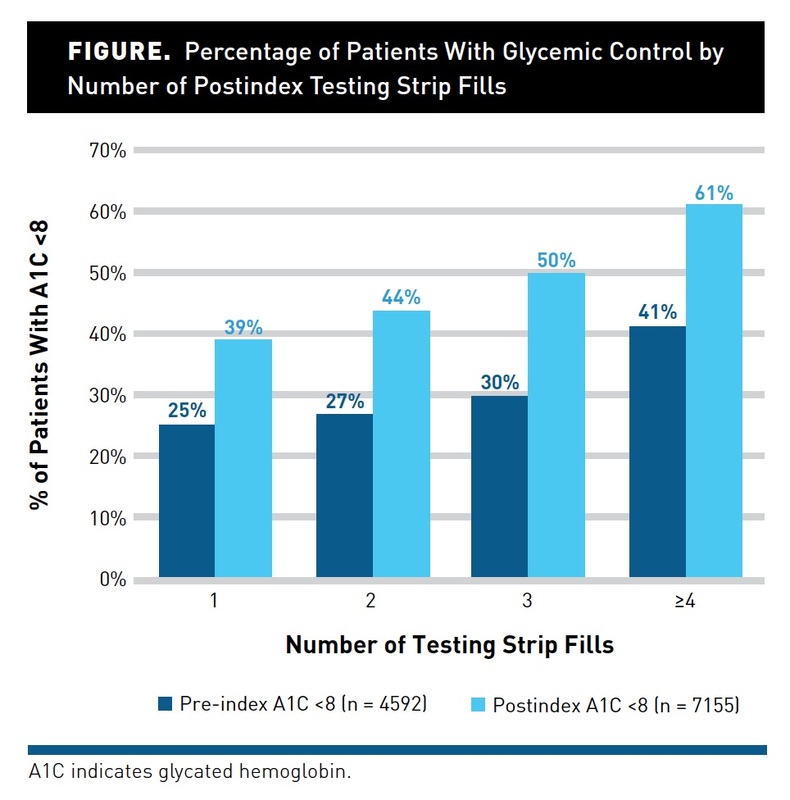 In the subgroup of patients with pre-index A1C values (n = 4592), the number of testing strip fills correlated with glycemic control. The proportion of patients achieving glycemic control rose with increasing numbers of testing strip fills both in the baseline and follow-up periods (Figure). When examining the changes in percentages of patients achieving glycemic control from baseline to follow-up, greater improvement was found among patients who had 3 or more testing strip fills (20% absolute increase in percentage achieving glycemic control) than among those with 2 fills or 1 fill (17% and 14%, respectively). In this real-world analysis, patients treated with insulin who had low cost sharing for testing strips were likely to achieve A1C control 58.1% of the time compared with 50.3% among patients with high cost sharing. Those in the low cost-sharing group filled more testing strips while paying lower OOP costs than those in the high cost-sharing group. After adjusting for patient characteristics, the relationship held: those with low cost sharing were 14% more likely to achieve A1C control than those with high cost sharing. In the sensitivity analysis on the subset of patients with both baseline and follow-up A1C tests, the relationship between low cost sharing and A1C control was still statistically significant. A previous cross-sectional analysis of the effect of co-pay changes found that testing supply utilization decreased when co-pays were increased by a California healthcare organization.12 However, when co-pays were eliminated and testing strips were offered free of charge, utilization rates unexpectedly were unaffected, regardless of income level or poverty status.12 When lower co-pays were reintroduced after the free period, utilization decreased marginally while adherence to SMBG recommendations remained unchanged.12 Notably, the relationship between testing strip usage and A1C levels was not examined in that study, which is a gap filled by the current analysis. In addition to the cost-sharing relationship, older age was related to a higher likelihood of glycemic control. This is consistent with literature indicating that the effect of age remained even after adjustment for other factors, such as duration of diabetes.20,21 Another striking relationship we observed was the association between A1C control rates and area median income. The regression analysis showed that patients in areas where the median income was higher than both $60,000 and $80,000 were 16% and 18% more likely, respectively, to achieve A1C control relative to individuals in areas with a median income lower than $40,000. Prior published studies were conducted in a pediatric population22 or outside of the United States,22,23 and all relied on self-reported income levels.17,22,23 Other investigations into a relationship between area median income and glycemic control were conducted in low-income populations, which presupposes an effect of income on achieving A1C goals.24-31 By quantifying the relationship between area income and glycemic control, our results are unique and provide more specific information to decision makers. The benefits of A1C control to patients with diabetes are well established. Individuals who are able to achieve A1C levels near to those of the population without diabetes are at reduced risk for diabetes complications.32 In addition to the clinical benefits for patients, there is a short-term (business-focused) justification for increasing A1C control rates within a population with diabetes. Increasingly, provider groups are being measured (and rewarded accordingly) on quality metrics via accountable care organization arrangements and patient-centered medical care models. Health plans are also rated by NCQA guidelines, which identify A1C control as a key metric for diabetes care. Lastly, Health Insurance Marketplace plans are also being scored and rated according to quality measures, including A1C control. Identifying benefit design–related strategies to improve adherence to diabetes self-management is highly important across numerous stakeholders. A number of possible actions could be taken based on these findings. First, payers may consider including diabetes testing strips in lower cost-sharing tiers or communicating to members the preferred testing strips that are in the lower cost-sharing tiers. Meanwhile, healthcare providers should ensure that the glucose meters prescribed to patients are compatible with the testing strips covered under the lowest tier formulary of the patient’s health plan. Patients may also be encouraged to use glucose monitor kits that work for the lower-cost testing strips. Another action may be for providers or payers to include monitoring of testing strip fills as part of the care management processes for people taking insulin medication. In this study, 10.7% of those in the low cost-sharing group and 17.7% in the high cost-sharing group did not follow through with a second testing strip fill after their first testing strip fill. In cases such as these, an outreach effort, such as refill reminders, could be triggered to highlight the importance of frequent testing. As with all studies relying on administrative and clinical lab data, this study had several limitations. A filled prescription for diabetic testing strips does not mean that the patient used all of the strips. We may be overestimating the relationship between cost sharing and actual testing; however, this presumably would not mean an over­estimation of the relationship between cost sharing and A1C control. Additionally, patients may have obtained testing strips through sources other than their health plan (eg, by purchasing them over the counter or with cash). In this case, we may be underestimating actual strip use. We mitigated this by excluding individuals with no fills, as we were unable to determine whether they were nonadherent or had procured testing strips through an alternate source. Diabetes onset and treatment duration cannot be adequately ascertained from administrative databases. Therefore, testing strips may be prescribed differentially to patients who have more severe diabetes or have failed previous antidiabetic regimens. We minimized this limitation by focusing our study on new users of testing strips who also received insulin therapy. However, we were unable to address unmeasured factors that could have introduced selection bias (eg, alcohol or illicit drug use, body mass index, diet, exercise, family history of diseases, actual adherence, and smoking). The data used for this study came from a single large US managed care population that may not be representative of blood glucose testing strip users in the United States. These individuals had better-than-average access to care and benefits, especially compared with low-income individuals. This would likely serve to underestimate the relationship between cost sharing and care outcomes. This study’s results suggest that lower cost sharing for diabetic testing strips for patients using insulin can remove a barrier to diabetes self-management and potentially lead to improved glycemic control at the population level. Future efforts should include calculation of expected return on investment in terms of reduced diabetic complications. The authors gratefully acknowledge the contributions of Sylvia Gates Carlisle, MD, and the programming work provided by D. Marc Cram. The authors also acknowledge Cheryl Jones, HealthCore, Inc, for editorial assistance.